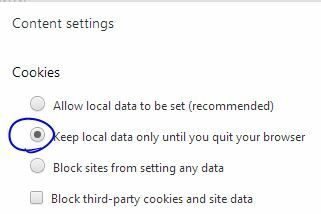 Check Your Browser’s Cache Settings! 99% of technical problems are due to incorrect browser “cache” settings. The browser cache stores pages downloaded to your computer from the Internet. As you work, Etudes is continually updating and storing pages in a database that is on a remote server, not locally on your computer. The browser must be set to always go out to the server and get new pages from the server and to not use old pages stored on your computer or errors will occur. Open a browser window, delete the address in the URL bar and type about:config. (no http or anything else). In the “search:” bar, paste “browser.cache.check_doc_frequency” and hit enter. It should be set to 1. If it’s not, double click on the text and in the resulting dialog box, enter 1 and click OK.
Quit and restart Firefox to enact the change. Go to Settings, and click on “Show advanced settings”. 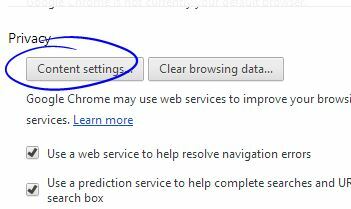 Click on OK. Close Settings tab back to browser. NOTE: This will also clear your cookie each time the browser is closed. Unfortunately, Chrome doesn’t have a mechanism to automatically clear only the cache. You could alternatively just routinely clear the browser cache (instructions provided below). Enable the Development Menu to clear the cache without clearing the History. From the Safari Menu Bar click Safari >> Preferences then select the Advanced tab. Select: Show Development menu in menu bar (at the very bottom of the window).